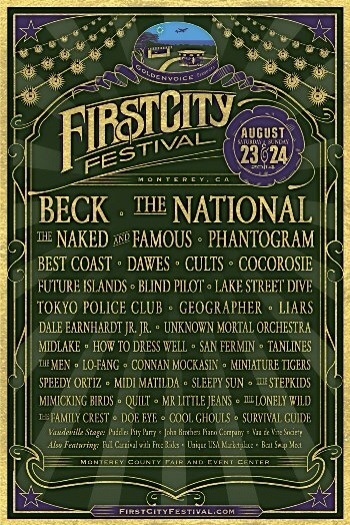 Beck and The National Headline at First City Festival in Monterey – Get Your Tickets Pronto! If you are not already planning on heading to the FIRST CITY FESTIVAL on August 23-24, 2014 in Monterey, CA, accrue your tickets, pack your bags, hitch a ride and get there. Beck and The National will be headlining this year at the incredible, two-day, boutique music and arts festival at Monterey County Fair and Event Center. It will be a weekend to remember for a lifetime. Three intimate stages will burgeon an eclectic mix of artists within a beautiful coastal setting. In addition to Beck and The National, over 30 artists including The Naked and Famous, Phantogram, Best Coast, Dawes, Cults, Cocorosie, Lake Street Dive and Blind Pilot will perform on the same grounds where the annual Monterey Jazz Festival takes place and the pioneering Monterey Pop Festival took place in 1967. Named after Monterey’s claim as the official “first capital” of California, FIRST CITY FESTIVAL attracted more than 10,000 art and music lovers each day in its debut year. Only one year later, two full days and nights of entertainment will be in full effect in the natural and historical setting of Monterey this August, complete with a carnival, complimentary rides and games, a full Craft-beer and Wine garden (featuring California wines and gourmet food vendors), and even a vinyl record marketplace curated by Beat Swap Meet (consisting of vinyl vendors and collectors from all over the state). FIRST CITY FESTIVAL is also the only U.S. festival to boast the Unique USA Marketplace, which features curated independent designers’ hand-made couture, all made in the U.S.A. Look for sweet vendors: The Poster List, Arts District Printing Co., Capital Eyewear, LoveNailTree, MNKR, Against the Grain, Richer Poorer, PUREnola, Hepp’s Salt Co., and many more.The weekend will be packed. BECK – PHANTOGRAM – BEST COAST – COCOROSIE – BLIND PILOT – TOKYO POLICE CLUB – UNKOWN MORTAL ORCHESTRA – MIDLAKE – HOW TO DRESS WELL – TANLINES – MINIATURE TIGERS – SPEEDY ORTIZ – THE STEPKIDS – MIMICKING BIRDS – MR LITTLE JEANS – THE LONELY WILD – DOE EYE – SURVIVAL GUIDE. THE NATIONAL – THE NAKED AND FAMOUS – DAWES – CULTS – FUTURE ISLANDS — LAKE STREET DIVE – GEOGRAPHER – LIARS – DALE ERANHARDT JR. JR. — SAN FERMIN – THE MEN – LO FANG – CONNAN MOCKASIN – MIDI MATILDA — SLEEPY SUN – QUILT – THE FMAILY CREST – COOL GHOULS. Vaudeville stage performers this year on both days will include: PUDDLES PITY PARTY, JOHN BROTHERS PIANO COMPANY AND VAU DE VIRE SOCIETY DANCERS. 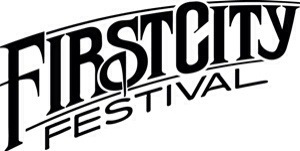 Tickets are on sale now at http://www.FirstCityFestival.com. Single-day GA tickets are $79.75 with no additional fees and unlimited carnival rides. Two-day GA tickets are $159.50 and VIP passes are $289.50 are also available with no service fees and a “layaway” option. Additionally, hotel and shuttle packages are available for purchase. The festival is all ages and will run from 12pm until 11pm each day.